E.A.N.G is a fictitious fashion label, composed of the initials of the authors who influenced the artist for the text printed on the transparent plastic inserted in the T-shirt. Both garment and object, the E.A.N.G. shirt addresses common patterns and uses them as a shaping structure. Moreover, the wearer herself becomes part of the staging: the text collage of an inner monologue enters between the view from the outside and the introspection of the body - sometimes brutal, often vulnerable and usually frustrated. "E.A.N.G. 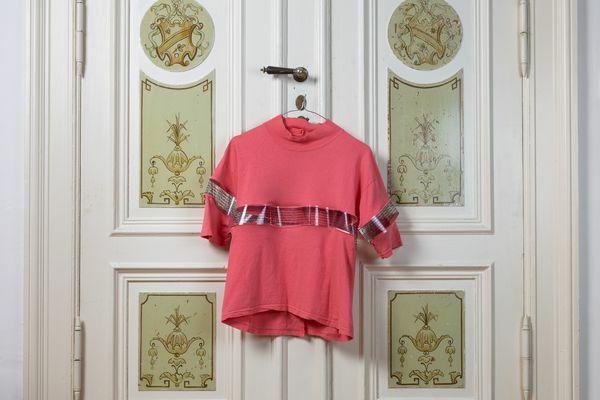 Shirt" was part of Gallery.Delivery | Berlin 2018.